History became legend, legend became myth – and some things that should not have been forgotten … were lost. In Glen Gillen's Slagle lecture at the 2013 AOTA conference he stated "We need to reclaim what we do..." This is not the first time that there has been a call back to our roots - we periodically re-visit this theme in occupational therapy. In order for us to develop a plan to 'reclaim what we do' we need to KNOW what we did. And why we did it. And what set us on the path to begin with. Social Justice: What would Dr. Kielhofner say? Principle 4. Occupational therapy personnel shall provide services in a fair and equitable manner. Historical roots of occupational therapy: A beginning explanation for the inquiry. 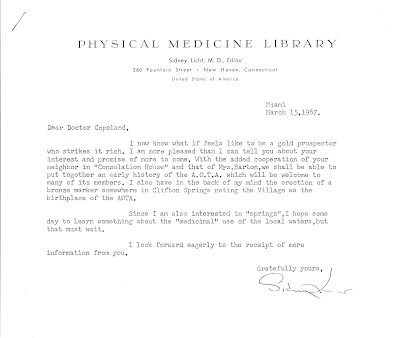 In the previous installment I talked about the curious letter from Dr. Licht to Dr. Copeland, who was the Mayor of Clifton Springs, NY. It was curious because Dr. Licht was so closely connected to Dr. Dunton, who was a Founder himself and attended the initial meeting at Consolation House. Looking back at the 50th year celebration of AOTA, we can see that Isabel (Newton) Barton, the wife of George Barton, was alive when Dr. Licht made his initial inquiry in 1967. She even wrote an article that appeared in AJOT in 1968 about her memories of Consolation House. This exemplifies the (probable) difficulty of information sharing in a pre-Internet context. It is difficult to understand any other reason why any 'disconnect' might exist and why Dr. Licht did not contact Mrs. Barton directly from the start. edit: For those looking for the full series of posts on this topic, please click on the 'History' button on the 'Labels' or use this link. I have been sitting on some historical source material for quite some time. I have been studying the material extensively, trying to decide the best way to share the information, and at times just putting it all aside out of frustration. When students learn about the founding of the occupational therapy profession they tend to read simple information in textbooks and it is somewhat devoid of context. History without context provides opportunity for misinterpretation, and this is something that I believe is important to try to avoid. Q: ­If a provider accepts a lower rate for a payment from an insurance company, the municipality will bear a larger portion of the expense, correct? A: If a provider accepts a negotiated rate of payment and that payment from the insurer is made in an amount less than the State-approved early intervention rate for the service provided, the ISFA will process payments for the balance due the provider from the escrow account using municipal funds at State established rates for the EIP. Billing providers will receive the full EIP rate for delivered services. If the provider does not accept the negotiated rate, and the insurer subsequently denies the claim for reasons such as out of network provider, then the entire payment will be made from the escrow account. 'Occupation' or 'function' as best descriptors for OT practice? It is too hot to go outside and do anything and I had to shut down my office as we lost power in a (presumed) brownout so I came to my home office and have been trolling around the Internet all afternoon. That rarely ends productively, but I was really happy to run across some comments from today's #occhat where there was a debate about use of terminology in the profession. Emails about early intervention while I was on vacation! I was on vacation last week and had MANY emails about early intervention and billing in my inbox. The most interesting one was from Chris Weis who states that he is a product manager for some billing software that is sold by the interim State Fiscal Agent for the NYS Early Intervention program. It was my favorite email so I thought I would share my response that I copied to the EIP as well. His initial email is in blockquote below. I write this second installment regarding public health in an attempt to document the pathway that the occupational therapy profession has taken with regard to its perspective on client autonomy, client-centered occupational therapy practice, and now calls to move toward public health models of intervention. An analysis of this topic can correctly start all the way back to the founding of the profession - including conversations about the musings of George Barton as he convalesced from tuberculosis - but for purposes of controlling the length and depth of the analysis I feel comfortable restricting the conversation to what I will label as the modern period, beginning in the 1960s. It is during the 1960s that important leaders and theorists promoted a return to the philosophical roots of the profession and a re-focus on occupation and habits which functionally reflects a respect for our philosophical core. Will a public health model make occupational therapy more relevant? I just finished watching the COT 2013 Annual Conference plenary by Michael Iwama. You can listen to his lecture by clicking here. Hopefully we will have accompanying slides in the near future. I was very anxious to listen to this presentation after watching the Twitter feed coming from the conference that included statements about our 'preoccupation with the individual' and that our 'practice has stalled' and that we were at a crossroads where we had an opportunity to take on a new role in a broader public health initiative. I was a little concerned about some of these statements and was not sure that I agreed. I am in the beginning stages of my own Twitter-acceptance and was not sure if those conference tweets fairly represented the presentation. I am happy to report that the quotes and concepts that people were tweeting from the conference were actually quite accurate and representative of the presentation.